Taking care of your pet’s teeth is one of the most important things you can do to keep them healthy because good dental hygiene can add years to your pet’s life. At Timberline Animal Hospital, we are dedicated ﻿﻿﻿to providing the best dental care for your pets. Our hospital features two full dental stations, the latest dental technology, digital dental radiography (xrays), and a medical team trained in advanced dental procedures. As part of our commitment to the importance of pet dental health, every member of our medical team completes additional ﻿﻿﻿continuing education in dental procedures from a Board Certified Veterinary Dentist. We also offer a full year Health Care Package with a dental billed monthly making it financially easier for you to provide your pet with the best dental care possible. Studies by the American Veterinary Dental Society report that 80 percent of dogs and 70 percent of cats show signs of oral disease by age three. If left untreated, small dental problems can develop into periodontal disease, can create infection, gum line recession, and lead to tooth loss. Routine dental cleanings and good oral hygiene are just as important for your pet’s dental health as they are for yours! Problems related to baby teeth, missing teeth, extra teeth, swelling, crowding, and oral development. Retained puppy teeth-this is common in smaller dogs and can affect both the position of the adult teeth and proper growth of the jaw. At Timberline Animal Hospital, because all pets are unique, we will conduct a comprehensive dental examination and create a tailored dental cleaning plan for your pet. Dental cleanings are performed under general anesthesia for all adult dogs and cats. For more detail about our dental cleaning procedure visit Dental Cleaning 101. You would never have dental surgery or extractions without an x-ray, why would your pet? We offer state-of-the art digital dental radiograph services. 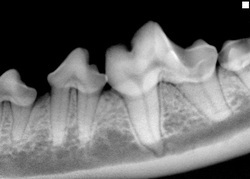 Digital dental x-rays aid in evaluating your pet’s oral health and detect impacted roots, tumors, devitalized teeth, infected roots, and fractures. X-rays also help our medical team detect abnormalities that cannot be seen through the physical examination alone. They can also confirm the need for tooth extraction when teeth are loose or badly infected. Oronasal fistula repair: When the canine teeth are infected so bad that it destroys the bone at the base of the tooth requiring extraction. Once the tooth is extracted it leaves a hole or fistula between the oral and nasal cavities (an oronasal fistula). To prevent infection this needs to be covered up with a gingival flap. Tooth resorption affects up to 75% of cats and is one of the most common and painful feline dental diseases. Tooth resorption is a dental condition where the supporting structures of the root become diseased and cause the destruction of the tooth. 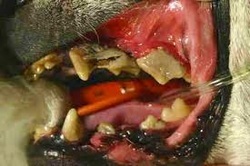 The entire tooth structure, root, and crown can be affected and it needs to be treated by a veterinarian. A dental assessment is the first step in diagnosing feline tooth resorption and digital dental radiographs are the second step necessary to diagnose the disease. Cow hooves, thick pig ears, natural bones, elk horns, or hard Nylabones. We are committed to providing the best preventive care for your pet. We also understand the financial impact of pet health care costs on you and your family. That is why we have created annual preventive Health Care Packages that you can pay monthly. We offer adult and senior Health Care Packages with a dental at a reasonable price. For more information please visit our Health Care Packages pages. Pet Dental Cleaning 101: Not all pet dental cleanings are equal.